The design of the barrier and adjacent flood walls replicate the architecture of the city’s famous buildings and walls. The scheme has received several awards by organisations including the Institute of Civil Engineers and the Brick Development Association. Just after Christmas, when the barrier failed, I went Googling for more info. If you Google ‘Foss barrier’ now you’ll get thousands of articles about its recent failure. So you might never find the interesting ‘historical’ documents I found, from the 1990s. Via those documents we can go back a bit, to recent history, to the days when the defences were new and exciting things. Compiled around 1991 (published in 1993) when the Foss Barrier was very new, other now familiar defences were quite new, and the North St/Wellington Row walls and gates had yet to be constructed: Public perception of rivers and flood defence (345/2/T) : flooding and flood defences in York by S M Tapsell, S M Tunstall and M Fordham. 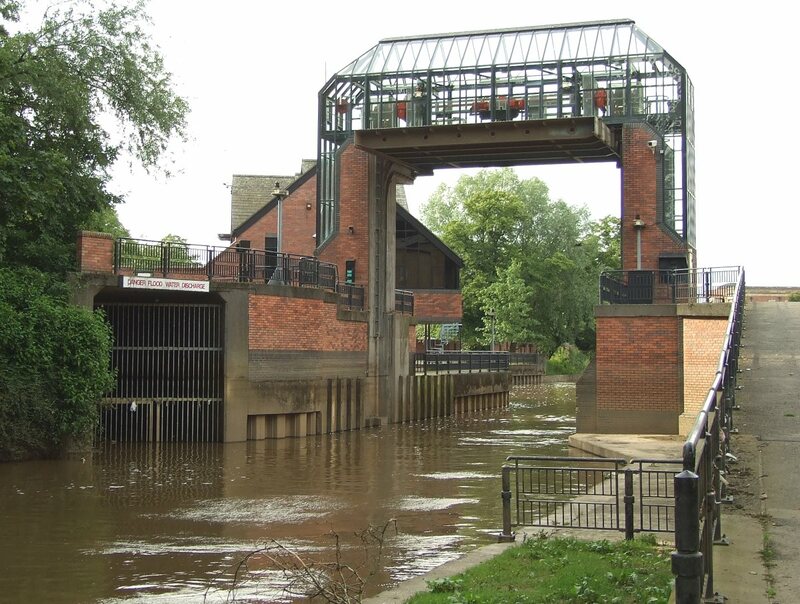 Researchers from Middlesex University studied perceptions of the York flood defences, working with the National Rivers Authority (since subsumed into the Environment Agency). The available PDF appears to be a photocopy and isn’t clear or enlargeable, so I thought I’d include a few sections here. I was at school and university when most of this flood-defence construction was going on, and I don’t remember it at all. But from this study — ‘the first attempt at a post project appraisal on the public perception of four of the York schemes’ — I learned that the proposals to construct the barrier met with opposition from some local residents, and that its original location and design was modified in response. Campaigners objected to the effect it would have on the immediate environment around it, and particularly that it would involve the felling of trees in New Walk. Over 200 people turned up at a public meeting on 22 March 1985 and gave the ‘thumbs down’ to the siting of the barrier near to Blue Bridge. According to the study, the council of the time wasn’t keen either, and didn’t want to contribute financially. … At the feasibility stage the pumping station was planned to be underground and people were told that this would be the case. 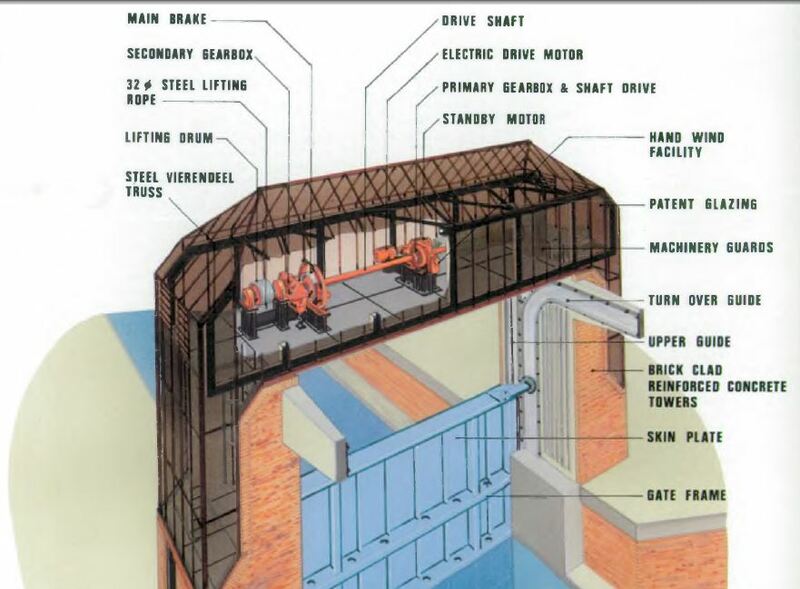 However, as the plans were revised a control room was added and much of the building was built above ground (although the pumps are mostly underground). This raised other objections as the building would be an ‘eyesore’ and would block some of the view for local people. I’m just wondering if that’s something that might have been avoided if this now leaky part of the structure had been built higher up, and if it was the protests of the 1980s about blocked views etc that meant it wasn’t? I’m not going to seek out documents in the archives to find out, as I’ve got far too many other things to do (including an overdue visit to Layerthorpe) but I thought I’d just leave that thought there, if anyone would like to ponder upon it further. Let’s return to the old days of the 1980s, as reported in the study. This caused some accusations to be directed at Yorkshire Water Authority as they had initially said that the Blue Bridge site was the only place where the barrier could be built. They were therefore accused of lying when the new site was proposed. A common thread between then and now — suspicions about various authorities lying to the public. The study refers to a campaign group of the time: the Huntington Road Flood Action Committee. I don’t suppose this is still going, but in light of recent events it could be something that residents of that area might want to resurrect. We may return to this interesting report, but for now I’d just like to remain with the Foss barrier and mention another document from the old days when it was all shiny and new. These were originally tributary to the River Foss but in the late 18th Century were culverted to the River Ouse. River Ouse levels are therefore reflected directly back up the culvert into the Becks. Which I thought was interesting, following on from my recent investigations into one of the watercourses on the other side of town. In order to prevent direct reflection of River Ouse water levels up the culvert, a 1.35m diameter diversion has been built which relocates the outfall in the River Foss upstream of the barrier, as indicated on Fig. 4. A branch off this diversion forms a bypass of the gate which can be used to equalise levels on either side of the gate prior to opening. So much going on with our rivers and watercourses and their defences, in recent years and before that. Perhaps one day, if we keep trying, we might get through a major flood without hundreds of homes and businesses having to send vast skipfuls of ruined goods and furniture to Harewood Whin — or wherever we send it to once Harewood Whin is full. Construction work on the Foss Barrier started in October 1986 and it was completed in November 1988. The agency took it over in February 1989 and it first operated a month later on March 24. The article: Flood barrier to be checked on-line dates from a full ten years ago (as that hyphen maybe indicates — in more recent years ‘online’ without the hyphen is more usual). Again, it’s worth a read, for facts and figures and general information about Foss barrier happenings in the years most of us were barely giving it a thought, before its failure made us all think about it and its mysterious workings.